The Kreeger Museum presents In Unison: 20 Washington, DC Artists. The exhibition is a result of a project initiated by the renowned Washington, DC artist Sam Gilliam who invited 20 artists from the community, working in different styles and media, to come together to make a series of five monoprints, one of which would be selected for the show. Curating the selection of prints were Judy A. Greenberg, Director of The Kreeger Museum, Marsha Mateyka of the Marsha Mateyka Gallery, Claudia Rousseau, Ph.D., art critic and art historian and Sam Gilliam. Counted among the participants are painters, sculptors, digital media and installation artists and a few printmakers, all established names in the DC region. Each was challenged to make monoprints in the welcoming environment of the print studios at the George Mason University School of Art. Printmaking is traditionally a collaborative art form. This enriching experience provided opportunities for interaction among the artists and promoted a true sense of collaboration. The exhibition is sponsored by the Millenium Arts Salon which has been serving the Washington, DC arts community for 10 years. The exhibition will be on view at The Kreeger Museum from January 15-February 26, 2011. Strathmore is accepting visual art exhibition proposals on an ongoing basis for the 2011-2012 season. Both group and individual proposals may be submitted to Strathmore, and all media are eligible. All completed applications are reviewed by the Strathmore Visual Art Department and curatorial staff. Decisions are made in accordance with Strathmore’s Mission and Guiding Principles. Harriet Lesser is curator with Holly Haliniewski at Strathmore for the 2011-2012 season. They will jury every 6 weeks to notify artists about the process. The Mansion at Strathmore is home to an exciting visual arts program which includes art exhibitions, education, and outreach programs. Strathmore presents visual arts programming in the Gudelsky Gallery Suite and first floor exhibition spaces at the Mansion at Strathmore, the 100-seat Dorothy M. and Maurice C. Shapiro Music Room, the outdoor Sculpture Garden, and across Strathmore’s campus.Strathmore is deeply committed to providing excellent, accessible arts programs to all audiences, while making available a "home for the arts" for our community. Contact Exhibits@strathmore.org for application guidelines and forms. The final word on the language of urban planning and design. The DC Creates Public Art mural "Community"at the Westminster Playground is featured in the book with artist credit Anne Marchand. You may consider purchasing this handsomely illustrated book and using the book as a reference. Book Description: The final word on the language of urban planning and design. The Language of Towns and Cities is a landmark publication that clarifies the language by which we talk about urban planning and design. Everyday words such as "avenue," "boulevard," "park," and "district," as well as less commonly used words and terms such as "sustainability," "carbon-neutral," or "Bilbao Effect" are used with a great variety of meanings, causing confusion among citizens, city officials, and other decision-makers when trying to design viable neighborhoods, towns, and cities. This magnificent volume is the fruit of more than a decade of research and writing in an effort to ameliorate this situation. 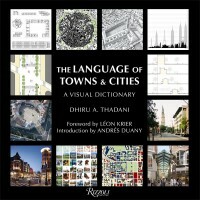 Abundantly illustrated with over 2,500 photographs, drawings, and charts, The Language of Towns and Cities is both a richly detailed glossary of more than seven hundred words and terms commonly used in architecture and urban planning, and a compendium of great visual interest. From "A" and "B" streets to Zero Lot and Zeitgeist, the book is at once comprehensive and accessible. An essential work for architects, urban planners, students of design, and all those interested in the future of towns and cities, this is destined to become a classic in its field. Hamiltonian Artists Fellowship Program is Now Accepting Applications for 2011-2013 Term. Hamiltonian Artists, a 501(c)3, is excited to announce its fourth annual open call to emerging artists to apply to our two-year Fellowship Program, aimed to aid in the professional development of contemporary visual artists. Please refer to the website for application requirements, restrictions and forms. The application process will close at 6:00 pm on on Monday, February 28, 2011, and any applications received after that date will not be considered. Hamiltonian Artists is a non-profit organization dedicated to providing professional development opportunities for creative artists early in their careers. They offer a competitive two-year fellowship program to new, innovative visual artists in all media through an annual competition. Artists from around the nation are encouraged to apply. "Fields and Networks: Alice Whealin"
The solo exhibition by Alice Whealin, Fields and Networks, features a series of ink drawings on acetate that reflect spatially both an expansive universe and small areas of function. The Children's Inn at the National Institutes of Health is a residential "place like home" for sick children and their families. Families stay in residence with the child while he/she receives ground breaking medical treatments at the NIH. While the NIH takes care of the child's medical needs, The Inn tends to the child's heart, soul and spirit. TThe Children's Inn at the National Institutes of Health is looking for artists to paint live at a May 20th 2011 event. The Washington Conservatory of Music will be playing a jazz concert at Glen Echo Park where artists will be asked to paint either the musicians as they preform, or abstractly paint the music itself (or some variation of the two). The five pieces produced that evening by artists will be silent auctioned for the benefit of the Children’s Inn at NIH. Artists must be able to paint quickly, and capture the spirit of the evening within the 2hrs 30 minutes of concert time. All paint and canvas for the event will be provided. Invited guests, will be entertained with extraordinary sounds and sights and have the opportunity to purchase the original artworks created that evening through a silent auction. Donations to The Children's Inn will also be gratefully accepted. The setting for the evening will be Glen Echo Park (GEP), a magical place situated on the Potomac Palisades near Bethesda, Maryland. Selected artists will also be participating in a group show for the month of April 2011 at the Pop Corn Gallery, Glen Echo Maryland. The five person group show will include the artists “typical work” and the artists will receive 65% of their sales, (gallery fee of 25%, 10% to Children’s Inn at NIH). Application is available to DC, Virginia and Maryland artists (representational and abstract) who are energetic, personable, and able to paint quickly. Approx. 200 attendees will be watching and biding on the work. To apply, send a CD with 15-20 images of current work, (first 10 pieces on cd must be available for the April show), resume, and a cover letter briefly describing why you would be good choice for the event. There is no application fee. For more information about the first annual event, email Jordan[at]jjbruns.com. "'Graham Caldwell: The Uncanny Valley' opens tonight with a free public reception from 6:30 to 8:30 p.m. 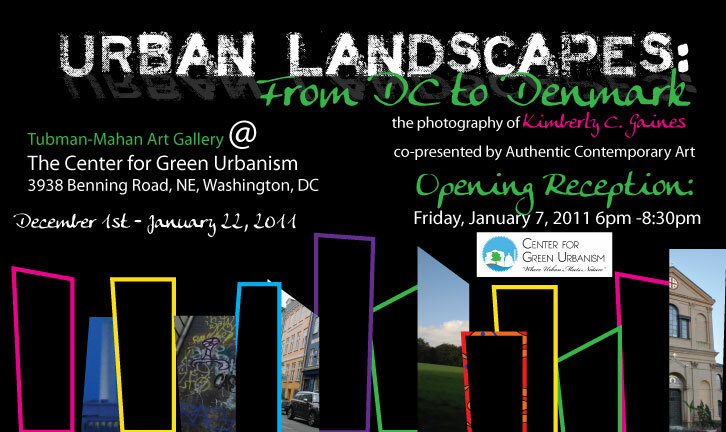 The show remains on view through Feb. 5 at 1350 Florida Ave. NE. 202-462-1601. www.gfineart.com." Yesterday, I took a lovely morning drive to Blackrock Arts Center in Germantown, MD with artist Sondra Arkin and friends. We had a lively dialogue about art and processes. Blackrock is approximately 50 minutes from Dupont Circle and yes! there's a Starbucks in the shopping center where it is located. The center is spacious and airy and offers art, musical performances and art classes. The art gallery is a wonderfully large open space which handsomely displays art on a scale that the three current artists, Carol Brown Goldberg, Sondra Arkin and Greg Minah, are exhibiting. It is refreshing to see an exhibition that deals with contemporary abstraction so beautifully edited and expressed. The exhibition is up through Thursday, December 23. You will be visually rewarded when you arrive! Read Claudia Rousseau's article on the exhibition in the Gazette. In the early 1990s, a group of Germantown, Maryland residents began to promote the concept of an arts center that would be located within their own community. Their idea became a rallying point for Germantown's active civic leadership. Within a year, the Germantown Cultural Arts Center, Inc. (d/b/a BlackRock Center for the Arts) was founded as a not-for-profit, 501(c)(3) organization to develop, own and manage BlackRock. 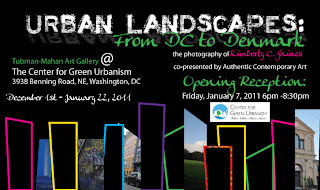 Join Authentic Contemporary Art for the digital photographic exhibit Urban Landscapes: From DC to Denmark by Photographer Kimberly Gaines, December 1, 2010 through January 22, 2011 at the Tubman-Mahan Art Gallery in The Center for Green Urbanism, DC’s newest art-infused green business incubator. The Center is located at 3938 Benning Road NE, Washington, DC. The Artist’s reception will be held January 7, 2011, 6:00 to 8:30 pm. The reception is free and open to the public. The mission of the Center for Green Urbanism is to create a business-friendly environment that provides startups with affordable office space and business services in a sustainable and energy-efficient green demonstration facility. 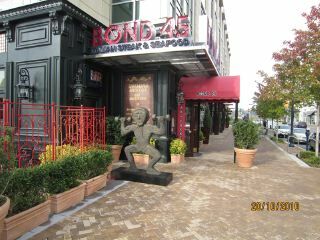 We are located in downtown Ward 7, Washington, DC. Meeting spaces are available and Wi-Fi is accessible throughout the facility. The Center is a design model for a “living green business” in an urban setting, by decreasing carbon footprint – promoting home gardening, using energy efficient lighting and appliances, solar shade window treatments, a purified drinking water system, water saving devices and the recycling of trash and waste.Learn more at The Center for Green Urbanism. Artist and Author Thomas Block finds common ground between Islam and Judaism. Read Gazette article by Brooke Kenny. The Silver Spring resident already is a well-known artist and activist. Matters of social justice fuel Block's paintings, as well his first book, "Shalom/Salaam: A Story of a Mystical Fraternity." "Shalom/Salaam: A Story of a Mystical Fraternity" is available for purchase at www.amazon.com. The Kreeger Museum is proud to present In Unison: 20 Washington, DC Artists, the culmination of a project initiated by renowned artist Sam Gilliam, consisting of 20 established artists from the DC community, working in different styles and mediums. The artists were invited to come together to create a series of five monoprints each, one of which was selected for the exhibition. "The ideas of creating a group portfolio and exhibiting together express the ideas of unity and identity that are underlying motives of the project, and which are vital to sustaining a thriving artistic community," says Claudia Rousseau, Ph.D., art critic and art historian. In Unison is a continuation of The Kreeger Museum's support and encouragement of artists in the DC metro area. The exhibition is sponsored by Millennium Arts Salon that has been serving the Washington, DC arts community for over 10 years. Millennium extends special thanks to the George Mason University School of Art for use of its print studio. 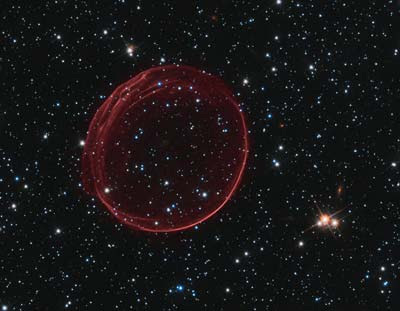 December 14, 2010: A delicate sphere of gas, photographed by NASA's Hubble Space Telescope, floats serenely in the depths of space. The pristine shell, or bubble, is the result of gas that is being shocked by the expanding blast wave from a supernova. WASHINGTON, D.C. – Spencer Finch: My Business, with the Cloud, the inaugural exhibition of NOW at the Corcoran, will close January 23, 2011.
from historical accounts by poets and philosophers to explore the persistence of human curiosity. Finch’s works play with light, color, and time to remind his viewers that looking is never as simple as it looks. On Tuesday, December 14 at 7 p.m., the Corcoran will host Spencer Finch as he discusses the inspiration behind his captivating work and exhibition. Attendees are invited to join Finch and the Corcoran Contemporaries for a light reception following the lecture. For ticket price and more information, please visit http://programs.corcoran.org/products/spencerfinch-on-art-and-inspiration. An exhibit entitled “Journey” was on view at the Greater Reston Art Center (GRACE) until November 12th. I had made the pilgrimage out there to see the show (and it did seem a pilgrimage from my home in Colesville, MD), and meant to write a review while the show was still up. Swamped with other work, I didn’t make it. Yet, I feel that some thoughts about this remarkable artist are in order, even now that the show has closed. Washington Project for the Arts announces the second annual holiday gift shop, IceBox. The shop features a wide variety of artworks and other handmade goods by WPA member artists. 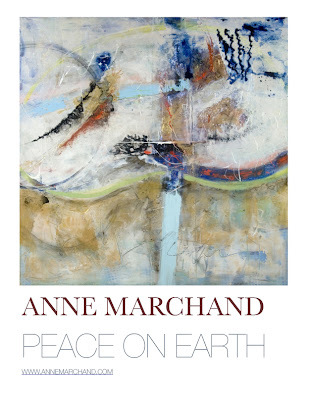 Participating artists include Double A Projects (Athena Robles and Anna Stein), Denee Barr, Sandy Gold, James Halloran, Linda Hesh, Ellen Hill, Rebecca Kallem, Alice Kress, Laurel Lukaszewski, Susana Raab, Amy Carmichael Smith, John Totaro, Katharine Watson, Robert Weiner and Claudia Vess. Featuring jewelry, small works of art, household goods, totebags and greeting cards, IceBox offers a great selection of creative, unique holiday gifts! IceBox, takes over the WPA office at 2023 Massachusetts Avenue NW, and runs through December 23. There will be a special shopping event on Monday, December 20 from 6:30-8:30pm. The shop will also be open Monday-Friday, from 12pm-5pm and by appointment. If you didn't get a chance to see Joe Corcoran's Glass works at the Art Registry Gallery at Todd Christofaro Holiday Open House yesterday, here's a sneak peek of some of the artists latest creations of hand blown color glass installations. Joe Corcoran assembles individual forms to create larger sculpural works that intertwine, link and rhythmically line the space they occupy. The glass is suspended by an iron and metal welded support system created by the artist. A central sculpture in the installation hangs from the ceiling like a chandelier that is at once calligraphic, lyrical line and metaphor. The artist sees it as a visual reminder of the way relationships form through interaction and conversation. The recent addition of neon to his work creates new pathways of reflection in the glass forms. 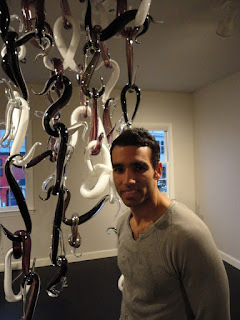 Several of his pieces are made up of identical blown glass shapes that hook together to create unique larger works with serpentine twists. Be sure to stop by and see Corcoran's beautifully crafted and lyrically seductive work. It was exceptionally brisk last night, great for walking in Georgetown and getting a feel of holiday cheer with twinkling light everywhere. We headed over to Addison Ripley to see acclaimed master printmaker, Lou Stovall's opening "No Editions: Painterly Prints". At 5:30pm the gallery was wiggling room only with fans, friends and collectors flocking thru the door to catch a glimpse of Lou and his beautiful new body of work. The silkcreens on view are full of saturated color and showcase the artist's imagination and technical accomplishment. Stovall's one of a kind prints are skillfully layered and exude a feeling of freshness and complexity in their mutli-layed stokes of color. Don't miss this marvelous show over the holidays!! Lou Stovall "No Editions: Painterly Prints". Check out pictures from last nights opening of Lou Stovall "No Editions: Painterly Prints" at Addison Ripley in Georgetown. Such wonderful work and a great show of support! Congratulations! to show her jewelry designs. Parish Gallery in Georgetown was opened in 1991 to represent, primarily but not exclusively, visual artists of significance from Africa and the African Diaspora. In selecting art and artists Parish Gallery exercises high ethical, curatorial and market selection standards, catering to the spirit of social preservation and regeneration in collecting the art. Parish Gallery has enriched the Washington art community by bringing harmony into the world through the promotion of international arts and culture. Click here to view map to visit! and peace and prosperity in the new year. December 12 at 2:00 p.m.
Book signing of The Image of the Black in Western Art (volumes 1–3) follows. Panel discussion includes David Bindman, emeritus professor of the history of art, University College London, and associate of the W. E. B. Du Bois Institute for African and African American Research, Harvard University; Faya Causey, head of academic programs, National Gallery of Art; Ruth Fine, curator of special projects in modern art, National Gallery of Art; Alison Luchs, curator of early European sculpture, National Gallery of Art; Sharmila Sen, general editor for the humanities, Harvard University Press; and Lou Stovall, master printmaker. Henry Louis Gates Jr., Alphonse Fletcher University Professor and director of the W. E. B. Du Bois Institute for African and African American Research, Harvard University, will no longer participate in the program in person. Lectures are free and open to the public. Seating is available on a first-come, first-seated basis. Registration is not required. The National Gallery of Art and its Sculpture Garden are at all times free to the public. They are located on the National Mall between 3rd and 9th Streets at Constitution Avenue NW, and are open Monday through Saturday from 10:00 a.m. to 5:00 p.m. and Sunday from 11:00 a.m. to 6:00 p.m. 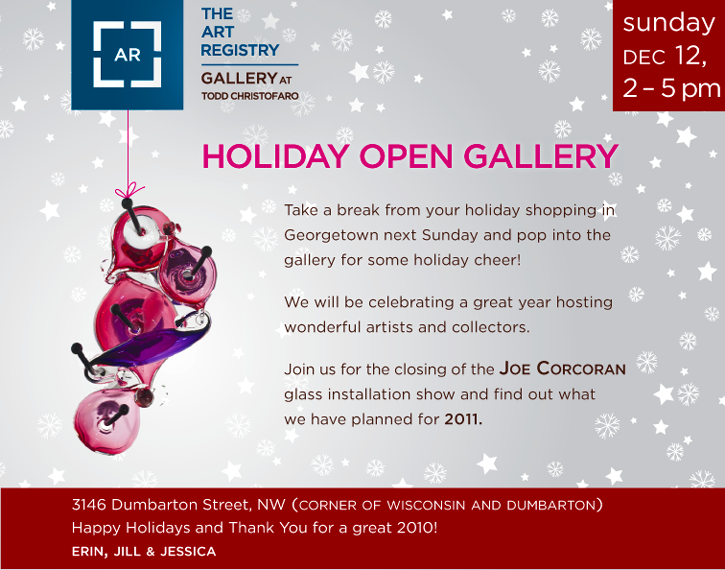 The Gallery is closed on December 25 and January 1. For information call (202) 737-4215 or the Telecommunications Device for the Deaf (TDD) at (202) 842-6176, or visit the Gallery’s Web site at www.nga.gov. 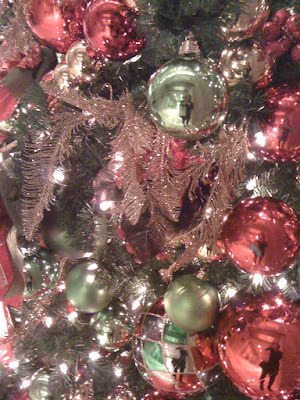 Follow the Gallery on Facebook at www.facebook.com/NationalGalleryofArt and on Twitter at http://www.twitter.com/ngadc. “Untitled,” a work of art by sculptor Thomas Sayre, a native Washingtonian who now lives and works in North Carolina, was installed last week at Nationals Park, the baseball stadium in D.C. where the Washington Nationals play. The baseball-related work at Nationals Park was commissioned by the D.C. Commission on the Arts and Humanities. No one from the media showed up for the installation. Mark Judge happened by and took video and interviewed the artist. See it below and read it here. by Mark Judge - Mark Gauvreau Judge is the author of several books, including Damn Senators and God and Man at Georgetown Prep. His articles and essays have appeared in various publications. Food Glorious Food VI Calendars Available Now! Do you have your calendar for the year 2011? Come see the exhibition of Art throughout the Pavilion. Calendars can be purchased for $20 from ZCAF Foundation, the Capital Area Food Bank and at Zenith's Space at Chevy Chase Pavilion. 202-783-8005 The Food Glorious Food is a unique annual collaboration between artists, top area chefs, businesses and individuals that has raised more than $100,000 for the Capital Area Food Bank in just four years. Launched in 2005, the mix of food, art and charity includes a month-long art show of food in all its fabulous forms; a calendar with art from the show and delectable recipes; and a calendar launch party and silent auction. Schmap.it - Donate Now: BloomBars Needs Your Support! : "BloomBars operate solely on donations from the community, and is requesting your support to keep BloomBars alive. Hillyer Art Space Moore produces giant bronze sculptures which portray insects, fish, and birds in unatural and fantastic situations. The sculptures featured in the exhibition will be a collection both of Moores' surreal fantasies of insects, such as Tiger Beetles as seen in Knight in Shining Armor and of his beautiful industrial designs. 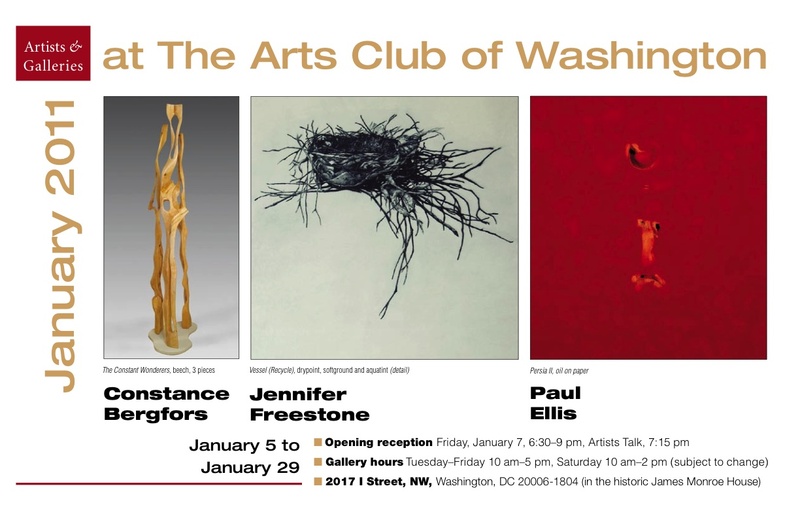 Hillyer is accepting submissions for the January Juried Members' Show, which will be curated by celebrated DC artist Barbara Liotta. Barbara will select about eight members to showcase 1-3 pieces each in the dedicated Members' Gallery for the period of one month. The deadline for submissions is Wednesday, December 15th. New: The juror has the option of selecting either a mixed Members' Show or a Member Solo Show from the entries. Please Note: The Members' Gallery is a multi-functional space which includes ample wall space for exhibitions and work space for International Arts and Artists' staff. Go here for an entry form. Magnolia Laurie, holding up; Jon Bobby Benjamin, going home. opening reception: Saturday, December 11th, 7-9pm. In her new series, holding up, Magnolia Laurie illustrates geometric structures that depict cumulated residual heaps of natural and man-made materials that remain after a storm. Seemingly disordered, her paintings are composed of architectural elements that suggest the engineering of Buckminster Fuller's Dymaxion as well as the intricate weaving of bird nests. These delicate, precarious systems in Magnolia Laurie's paintings speak of endurance, survival, the activity of dwelling and "making-do." Jon Bobby Benjamin's new work, going home, reflects his physical exploration of the natural world. Benjamin creates sculptural amalgamations of familiar industrial materials and found maritime objects. Consisting of buoys, docks, channel markers, and tide bells, Benjamin creates systems that are seemingly inaccessible and unreadable. These irrational arrangements distill a sense of timelessness, placeless-ness, and solitude. holding up / going home will be on view from December 11, 2010 to January 15, 2011, with an opening reception on Saturday, December 11th, from 7-9pm. Chris Blackwell book signing at Govinda / Friday - Dec. 10, 6 to 8 p.m.
Everyone at Govinda Gallery is getting excited to welcome Chris Blackwell for his book signing this Friday, December 10th, from 6 to 8 p.m. This is a great opportunity to get that music lover in your life a special signed gift! Blackwell will be signing copies of Keep On Running: The Story of Island Records (Universe Publishing). Here are a few visuals from the book and some details regarding Island Records connections to Washington D.C. Discuss "Where We Are Going"
On the White House Ellipse, the National Christmas Tree will dazzle after the Obama family turns on the holiday lights on December 9th. The tree will be re-lit from dusk to 11pm each night, and there will also be free nightly performances through Jan. 1. Beautifully decorated trees will also be on display at The U.S. Capitol and Union Station. For a little outdoor fun, the National Gallery of Art Sculpture Garden offers ice skating against the backdrop of magnificent sculptures and warm treats at the Pavilion Café (mid-December - mid-March). Or, grab a cup of hot cocoa and browse the kiosks filled with local artists’ creations at the Downtown Holiday Market along F Street between the National Portrait Gallery and the International Spy Museum. National Zoo's "ZooLights" (Dec. 3-12 & Dec. 17- Jan. 1) - free this year! Addison/Ripley Fine Art presents an exhibition of recent unique silkscreens by Lou Stovall, "No Editions: Painterly Prints", works that display the full range of the artist's extraordinary imagination and technical accomplishment. These works show Stovall as a true heir to the groundbreaking work of the Washington Color School and a ceaseless innovator in his own right. As indicated in the title, these are one of a kind prints, skillfully layered, dazzlingly rich in color. Lou Stovall was born in Athens, Georgia in 1937 and grew up in Springfield, Massachusetts. He studied at the Rhode Island School of Design and at Howard University (B.F.A.). Since 1962, he has lived and worked in Washington, DC. His drawings and silkscreen prints have brought him grants from the National Endowment for the Arts and the Stern Family Fund. Under his direction, Workshop, Inc. has grown from a small but active studio primarily concerned with community posters into a professional printmaking facility. Stovall's craft is that of a master printmaker but his passion is drawing. His own prints and drawings are part of numerous public and private collections throughout the world. Through Workshop, Inc., founded in 1968, he has made a unique effort to build a community of artists in Washington, DC and to encourage, by his own example, service in the community. Along with his own work, recognition as a master printmaker has gained him commissions to print works of such noted artists as Josef Albers, Peter Blume, Alexander Calder, Elizabeth Catlett, Gene Davis, David Driskell, Sam Gilliam, Lois Mailou Jones, Jacob Lawrence, Robert Mangold, Mathieu Mategot, A. Brockie Stevenson and James L. Wells. Among his special commissions he designed the Independence Day invitation for the White House in 1982 at the request of Mrs. Ronald Reagan. In 1986, at the request of Mayor Marion Barry, he made the print American Beauty Rose for the Washington, DC Area Host Committee 1988 Democratic National Convention. In 1996 he designed and made the print Breathing Hope to honor Howard University's incoming president H. Patrick Swygert. This month highlights the work of End of the Weak (EOW, LLC). At the heart of Hip Hip music is the desire to spread knowledge and to create a community united through stories of displacement and struggle. 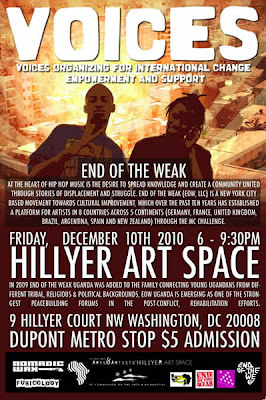 End of the Weak (EOW, LLC) is a New York city based movement directed towards cultural improvement. Over the past ten years EOW has established a platform for artists in eight countries across five continents (Germany, France, United Kingdom, Brazil, Argentina, Spain and New Zealand) through the MC challenge. Shining a spotlight on the creative possiblities that Firepainting brings to art, Zenith Gallery presents beautiful works by Peter Kephart, an artist new to Zenith's roster, recognized for his unique technique and approach using fire to make art. 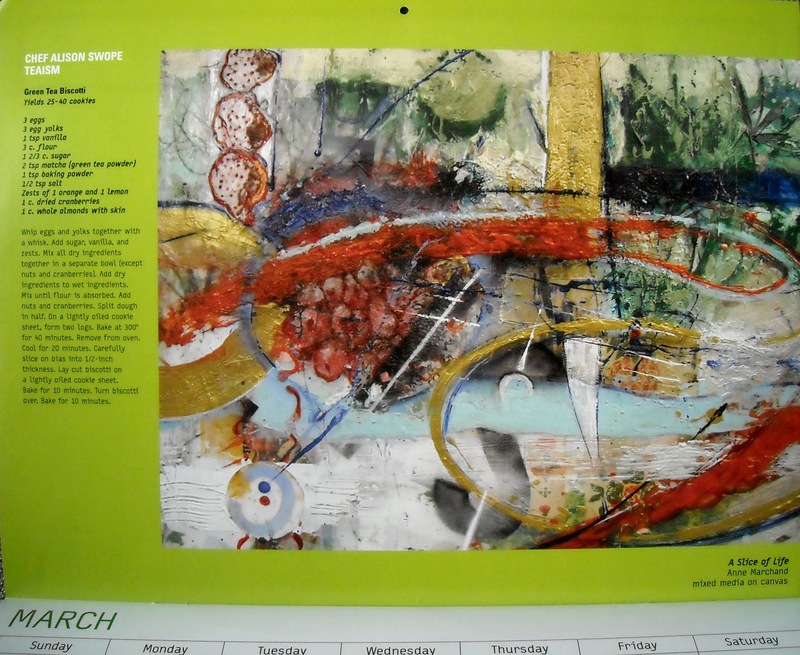 Exhibiting his art in New York, Chicago, Philadelphia and Washington DC, Kephart's paintings are included in a rapidly growing number of private and public collections in the United States and abroad. 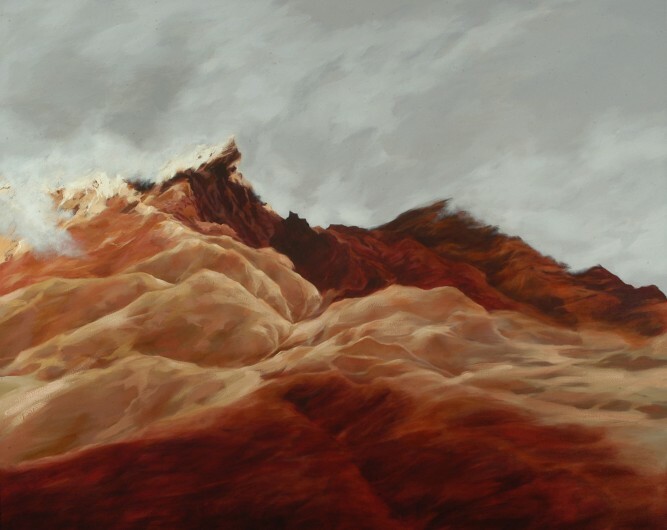 The exhibition, Painting with Fire, will open with a “Meet the Artist” reception on Wednesday, December 8, 6-8 PM in Zenith’s gallery on Level 2 at Chevy Chase Pavilion, (next to Embassy Suites Hotel) and remain on display through February 8, 2011. Wednesday, December 8; 7 p.m.
Long before Inception—even before The Wizard of Oz—Surrealist artists led film audiences on a giddy flight from reality, liberating cinema from the duty of replicating the external world, and turning the camera’s eye inward to coax the hidden realm of dreams into the light. In this talk, Corcoran professor Bernard Welt demonstrates how the exploration of provocative analogies between dreams and cinema created the language of classic and contemporary fantasy film. Members free; Public $10. Register http://programs.corcoran.org/products/the-aesthetic-of-the-dream-in-surrealist-film. Thursday, December 9; 7 p.m. Since exhibiting his work at the Corcoran’s 35th Biennial Exhibition of Contemporary American Painting in 1977, John Alexander has become internationally renowned for his powerful, detailed, and sometimes satirical paintings and drawings of the natural world. Alexander discusses his prolific career, his first exhibition at the Corcoran, and the humor so often found in his unique artworks. Pre-registration encouraged. Members free; Public $10. register, visit http://programs.corcoran.org/products/the-nature-of-art-the-work-of-john-alexander. Tuesday, December 14; 7 p.m.
At the core of Spencer Finch's work is the ongoing investigation into light, color, memory, and perception. Drawing inspiration from historical accounts by poets and philosophers, his sculptural installations, photographs, and drawings seek to recreate individual experiences or particular sensations such as candlelight or the wind off of Walden Pond. Join Spencer Finch as he discusses the inspiration behind his captivating work and exhibition, Spencer Finch: My Business, with the Cloud, on view now. Members $16; Public $20. Register http://programs.corcoran.org/products/spencer-finch-on-art-and-inspiration. Performances at 11:30 a.m., 1 p.m., and 2:30 p.m. in the Rotunda Join acclaimed choreographer Dana Tai Soon Burgess and his contemporary dance company as they debut their site-specific dance piece, “America’s Cloud.” The dance—inspired by the large-scale cloud sculpture suspended in the Rotunda as part of the exhibition Spencer Finch: My Business, With the Cloud—is the culmination of Burgess’ month-long residency at the Corcoran. Free with Gallery admission. http://programs.corcoran.org/products/product. Prior to the performances, Corcoran College of Art + Design Docents will give tours of Spencer Finch: My Business, With the Cloud. Tours begin at 11 a.m., 12:30 p.m., and 2 p.m. and are free with Gallery admission. Thursday, December 9, 5–9 p.m.
December 11–20 Reception: Thursday, December 16; 6–8 p.m.
HEMPHILL presents High Notes featuring Alexandra Phillips, Soprano. High Notes includes operatic arias from some of the most lively, dramatic, and playful heroines in opera- including the crazy Lucia from Donizetti's Lucia di Lammermoor; a wind up doll Olympia from Les Contes D'Hoffmann; Bernstein's desperate Cunegonde from Candide, Strauss's flirtatious Zerbinetta from Ariadne auf Naxos; and Mozart's dignified but love stricken Kostanze from Die Entfuehrung aus dem Serail. This evening of art and opera celebrates the CD and iTunes release of High Notes amidst Hemphill's current exhibition, Julie Wolfe. Alexandra Phillips, Soprano, is a classically trained opera singer and performer, who loves to explore the collaboration and fusions of different genres and techniques. She has soloed at such venues as the Kennedy Center, the Folger Theatre, The White House and the Piccolo Spoleto Festival. Alexandra has recently returned from a three month performance tour in Italy. She is a graduate of the Eastman School of Music, and received a Master’s Degree in vocal performance from The University of Tennessee. Operatic roles she has performed include "Olympia' in Les Contes D'Hoffmann, 'Lucia' in Lucia di Lammermoor, Thais in Thais, Die Koenigen der Nacht, in Die Zauberfloete, 'Amy March' in Adamo's Little Women, and Mabel in Orlando Ballet’s production of Pirates of Penzance. Alexandra has been a soloist with the Washington Arts Club, the Great Noise Ensemble, Congressional Chorus, Interact Theatre, Washington Savoyards, Washington Choral Ensemble, Friday Morning Music Club, the Paul Hill Chorale and the Master Chorale of Washington, and has been a guest singer/speaker on NPR. Oratorio highlights include Bach’s St. John’s Passion, Bach’s St. Matthew’s Passion, Saint-Saens’ Christmas Oratorio, Haydn’s Creation, and Mozart’s Coronation Mass, Messiah, Poulenc’s Gloria, and Schwantner’s Sparrows. As an educator, Alexandra holds a private voice studio in DC, and holds an adjunct faculty position at Montgomery College in Rockville. She encourages singers of all ages and levels to explore their voice, and helps them expand their potential. The Global Lens 2010 international film series features independent films from around the world depicting stories about different cultures and people. The final curated film screening will be held this month. Refreshments will be served and a special Q&A with Reel Worldwide Underground Link (RWUL) will be held after each screening. The non-profit organization Reel Worldwide Underground Link (RWUL) was selected by the Global Film Initiative to host the Global Lens 2010 film series in Washington, DC. RWUL has hosted screenings in DC of this series all year long. The Hillyer Art Space and International Arts and Artists will curate this film in conjunction with existing exhibitions. The December 8th film screening is My Tehran For Sale from Iran. This will be last screening in the 2010 Global Lens films series. In this riveting, insider's perspective on life in Iran's capital city, Marzieh-a terminally ill actress-wearily relates her desperate quest for political asylum through a series of interviews with an unsympathetic government official. Beginning with details of her doomed relationship with an Iranian-born Australian and their plan to relocate to Adelaide, she recounts her struggle to work as an actress under Iran's current regime, her hope for a future ultimately dashed by the devastating discovery of her illness, and her need to "escape" the only home she has ever known. Set against the backdrop of Tehran's thriving arts culture, and framed through a series of artful and dramatic flashback sequences, poet-turned-filmmaker Granaz Moussavi boldly registers the trials of a modern woman struggling to flourish in Iran's contemporary political climate. Granaz Moussavi was born in Tehran, Iran in 1974. She received a degree in Screen Studies from Flinders University and a postgraduate degree in Film Editing from the Australian Film Television and Radio School. She is the author of four collections of avant-garde poetry and has directed and edited several short films and documentaries. My Tehran For Sale is her first feature film. Tennis star Venus Williams came to shop, New York Yankees third baseman Alex Rodriguez came to dinner. They joined the 46,000 others that packed into the five- day Art Basel Miami Beach, dispelling any doubts that the market for contemporary art has left the recession behind. “The fair was amazingly successful compared with last year,’’ said Donald Rubell, 70, hotelier and collector, seated in the courtyard of a 45,000-square-foot former Drug Enforcement Administration warehouse that now houses the Rubell Family Collection of contemporary art. Over THIRTY Artists and Crafters. 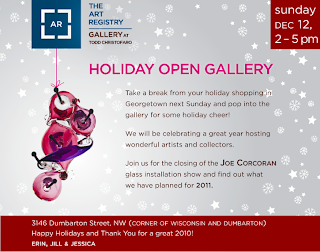 The fifth annual holiday art sale is a great place to find something unique for yourself or someone on your gift list. Jewelry, pottery, photography, wearable art, tilework, paintings and prints as well wood items - funky and fine, functional and fun - you will be sure to find it at the Takoma Park Community Center on Saturday, December 11. There will be arts activities for the kids while you investigate the offerings of over 30 local artists. Music provided by the Takoma Park Singers, the Love Joy Group and Class Notes. Participating in this year’s event are Jay Blake, Ken Gelding, Adam Lebow, Denise Bentley, Marcie Wolf-Hubbard, David Hubbard, Bobbi Kittner, Sam Kittner, Rob Rudick, Karen Kruger, Orion McCarthy, Jan Morales, Patti Mallin and Keith Patterson. 20 videos from 13 countries were selected from among 223 entries by an international jury composed of Marina Galvani, Curator of the Art Program of the World Bank, and Edgar Endress, Assistant Professor of Digital Media Technologies at George Mason University. The Fifth Edition of the Inter‐American Biennial of Video Art will open at the Gallery of the IDB Cultural Center, in Washington, featuring 20 videos from 13 countries selected from among 223 entries from 20 countries, including Puerto Rico. This year, the Biennial celebrates its first decade of existence. • First Prize of US$4,000 to the video “Faber,” by Boris David Franco Navarrete, of Chile. Second Prize of US$3,000 to the video “Between My Hands,” by Alexandre Braga Brandão, of Brazil. Third Prize of US$2,000 to the video “Vigilantes (Museum Guards),” by Benjamín López Alcántara, of Mexico. Honorable Mention of US$1,000 to the video “Aún aquí (Still Here),” by Paulina Alicia del Paso Gordillo, of Mexico. Honorable Mention of US$1,000 to the video “Se me pergunto, por quê meus lábios negam respostas? (I Ask Myself, Why Do My Lips Refuse to Answer? )” by Joacélio Batista de Sousa Da Silva, of Brazil. Artist Reception: Sat. Dec. 4, 5 - 7 p.m.
CITY Gallery pays tribute to the late Wally Szyndler. CITY Gallery announces a show of gourd sculptured by the late local artist Wally Szyndler. The exhibition will be on display from November 30, 2010 through January 1, 2011 with an opening reception Saturday, December 4 from 6-9 pm. Szyndler became interested in gourd art after finding a book on gourds in a local bookstore. Mostly self-taught, Szyndler learned much of his craft from books but also travelled the country to take workshops. Early on, he often went on scouting trips to find "diamonds in the rough” at a farmer’s market near Annapolis, MD. In Szyndler's words "my many years of living and working in other countries sparked an enthusiasm for the use of masks in other cultures, especially those of Africa, India and the indigenous peoples of the Americas. Gourds appealed to me because they are a gift from nature just waiting to be carved and chiseled into a beautiful mask. It is interesting that from the inception of an idea to the creation of the final product is often very different from what I have visualized, often in my dreams." Wally Szyndler passed away on July 10, 2010. This retrospective offers the community at large an opportunity to celebrate his life and his passion. All proceed from this show will go to to Art Enables, a studio and gallery for emerging artists with developmental and/or mental disabilities. City Gallery, 804 H ST NE second floor, Washington, DC 20002. Gallery hours are Saturdays and Sundays 1-5pm. Upakar is a registered 501(C)3 and was founded in 1997 to assist Indian Americans who require financial assistance to pursue an undergraduate degree at a U.S. based college or university. It is further dedicated to the promotion and recognition of excellence through the support of the Indian community. Upakar will proudly award 20 scholarships this year and hopes to grow that number with community support.